We posted a male Blue Dacnis on Tuesday. Here is a photo of the female. They both have amazing coloration. 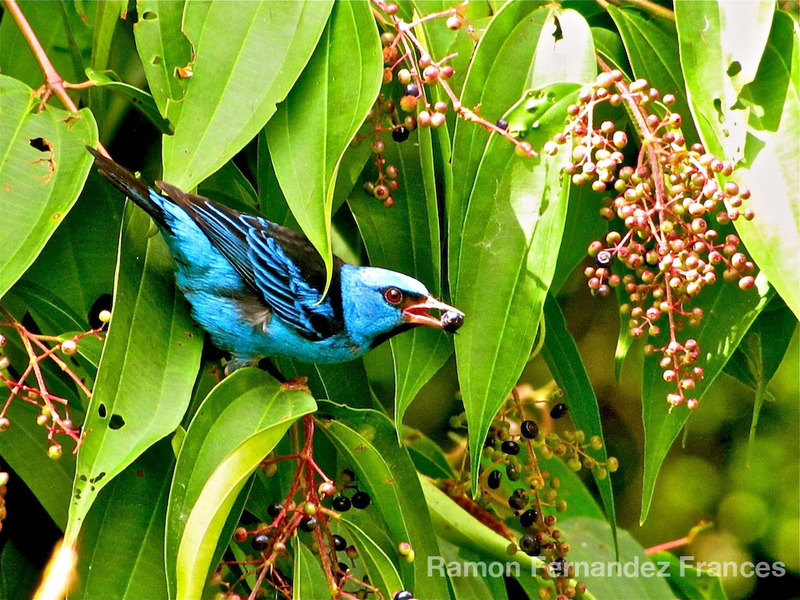 The Blue Dacnis is a small member of the tanager family is found from Nicaragua to Panama, on Trinidad, and in South America south to Bolivia and northern Argentina. It is widespread and often common, especially in parts of its South American range. It occurs in forests and other woodlands, including gardens and parks. The bulky cup nest is built in a tree and the normal clutch is of two to three grey-blotched whitish eggs. The female incubates the eggs, but is fed by the male. The Blue Dacnis is about 12.7 cm long and weighs around 13 g. The adult male is turquoise blue with a black around the eyes, and on the throat and back. The wings and tail are black, edged with turquoise. The female and immature are mainly green with a blue head, paler green underparts and green-edged brown wings. These are social birds which eat mainly insects gleaned from foliage, flowers or bromeliads. Fruit is often taken and usually swallowed whole, but nectar is rarely consumed. The Blue Dacnis’s call is a thin tsip. Here is another video that includes some iguana footage. They are fascinating creatures. The opportunity to view them in the wild is special. We appreciate this privilege and would like to share it with you. Mating pair of Green Iguanas found off the porch of our main building. Ramon captured this photo last week. The Green Iguana or Common Iguana (Iguana iguana) is a large, arboreal herbivorous species of lizard of the genus Iguana native to Central, South America, and the Caribbean. A herbivore, it has adapted significantly with regard to movement and body temperature regulation as a result of its diet. It generally grows to almost five feet in length from head to tail with body weight upward of 20 pounds. Green Iguanas are daytime animals that live in the trees and are often found near water. Ours are agile climbers, as we are observing them on the branches of trees for the most part. An Iguana iguana can fall up to 50 feet and land unhurt by using its hind leg claws to clasp leaves and branches to break a fall. Despite their name, Green Iguanas can come in different colors. In Costa Rica they tend to have red coloring, in Mexico it is an orange coloring. 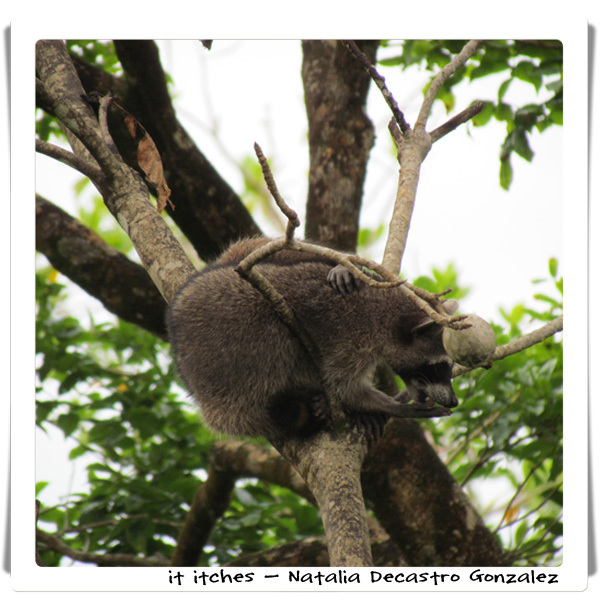 Here in Bocas del Toro, the coloration is normally green with orange coloration coming out during mating season. 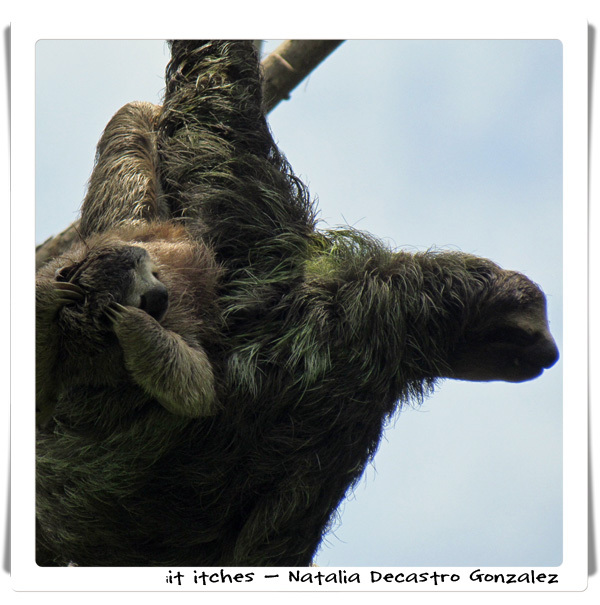 Mating season in Bocas del Toro hits around the end of March or the beginning of April and lasts for about a month. Iguana iguana have a row of spines along their backs and along their tails which helps to protect them from predators. Their whip-like tails may be used to deliver painful strikes and like many other lizards, when grabbed by the tail, the iguana can allow it to break, so it can escape and eventually regenerate a new one. In addition, iguanas have well-developed dewlaps which helps regulate their body temperature. This dewlap is used in courtship and territorial displays. Green Iguanas have very sharp teeth that are capable of shredding leaves and even human skin. These teeth are shaped like a leaf, broad and flat, with serrations on the edge. The teeth are situated on the inner sides of the jawbones which is why they are hard to see in smaller specimens. 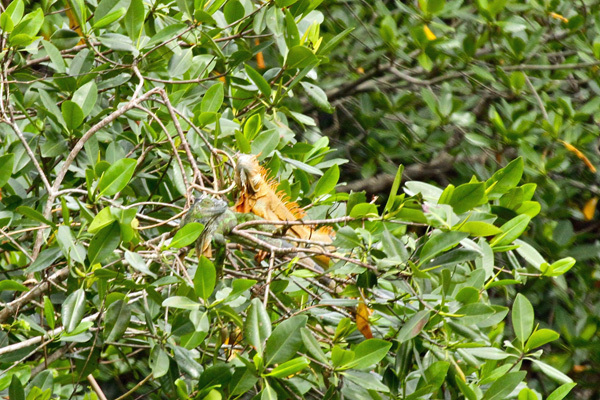 We have been watching iguanas in the mangrove treetops for the last few weeks. They have changed colors for mating season and are much more visible than under normal circumstances. In looking at one through the scope on the porch this morning it reminded me of this video Jim and Tres did three years ago. It is amazing how much Tres has grown. I am impressed that the information he provides in the video is still spot on. Take a look for yourself. 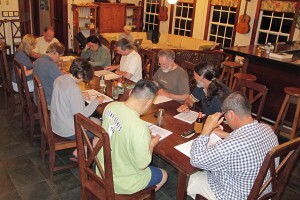 We were fortunate to host a group of eight birders last week. This group included a number of professional and semi-professional birders who were checking us out. The group also experienced a trip to our dear friends’ organic chocolate farm and water excursions near Tranquilo Bay. The number of other animals and wildlife the group encountered was truly amazing. 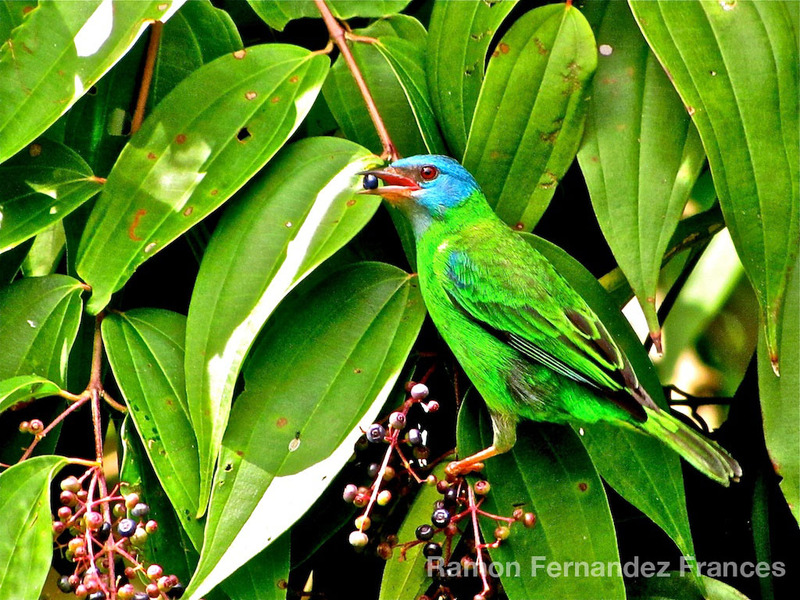 They birded a number of different locations throughout the Western Caribbean Slope. We were blessed with amazing conditions and a lot of birds this week. The total number of birds seen on the seven-day trip was 272. There were eight more that they heard for a total of 280 birds. Needless to say we were pleased. The group’s trip report will be available within a few months and we will share it with you at that time. Our daughter, Boty, likes to find hidden pictures in Highlights magazine. When I saw this photo it reminded me of those exercises. This is nature at its finest. 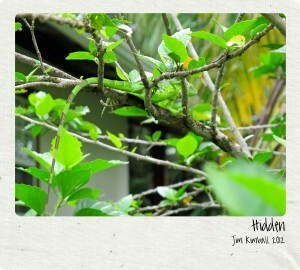 The lizard in this picture is just doing his thing, but Jim had to take a double look to find him. The first time I saw the photo I wasn’t sure why he took it. Second look – got it. You try it.